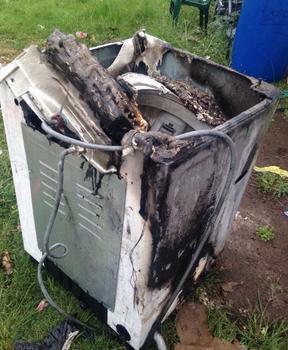 This consumer's Samsung washer caught fire. It took Samsung many months to issue a recall of top-loading washing machines that can basically shake themselves apart and send pieces flying through consumers' laundry rooms. Now an Oklahoma man says the company hasn't followed through on its recall of the machines. In a lawsuit seeking class action status, Jerry Wells says the remedies Samsung is offering aren't adequate. Wells says he has made numerous attempts to have his machine repaired, alleging that although he made three appointments, no service person ever showed up. Wells isn't alone. Many other consumers have complained that Samsung either refused to repair their washer or, as in Wells' case, failed to do so successfully. 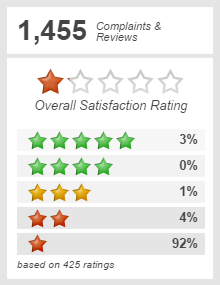 "My new Samsung washer has slammed itself all over the laundry room. I have readjusted it on about every load. It barely uses any water and soap is stuck to my jeans. I have never washed bedding," said Cindy of Jacksonville, Ala. "It goes nuts on towels or jeans. Now I find out it is on recall. ... I guess they didn't want to refund my money." The recall offered consumers the choice of a warranty extension and in-home repair, a rebate on a new machine, or a complete refund if the consumer had purchased the machine within 30 days of the date the recall was issued. Wells says he chose the warranty extension and repair, but Samsung has failed to deliver. His suit seeks to represent consumers who purchased one of the 34 recalled models between March 2011 and November 2016. He is asking for a court order that would require Samsung to replace parts or entire washers free of charge. Wells also asks the court to bar Samsung from continuing to manufacture the top-loading machines, saying they are a hazard to consumers' safety. Samsung has conceded that it has received nine reports of injuries resulting from flying parts, including a broken jaw and injured shoulder. It has received hundreds of reports of damage to the machine resulting from excessive vibration. Wells' case was filed in the U.S. District Court for the Western District of Oklahoma. He is represented by attorney William B. Federman.